The project will maintain two lanes for vehicle traffic but restrict parking to the east side for most of the street and add bike lanes, including some stretches protected by a 3-foot buffer. The ever-increasing competition over street space in Seattle has found a new battleground. This time it’s a 2.3-mile strip of 35th Avenue Northeast, a major arterial that runs through the Wedgwood, Ravenna and Bryant neighborhoods. 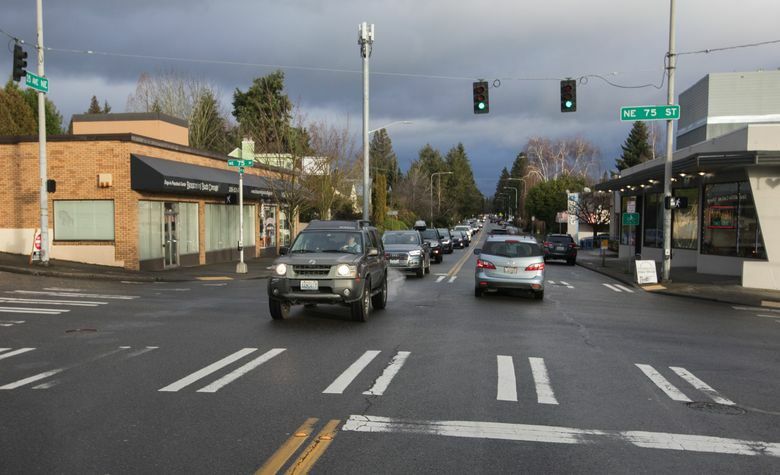 The Seattle Department of Transportation (SDOT) is set to begin construction in the spring to repave and reconfigure the avenue between Northeast 89th Street and Northeast 47th Street. Funded by the $930 million Move Seattle levy that voters approved in November 2015, the work is part of SDOT’s ongoing effort to improve street safety citywide and make roads accessible to different kinds of users. The project will cost up to $7.9 million and should be completed this coming fall or winter. Pushback has been swift and fierce. Critics see the plan as an ill-conceived and inconvenient attempt to prioritize cyclists over drivers and pedestrians. They object to any concession of parking space and say designers blindsided and ignored them in the planning process. 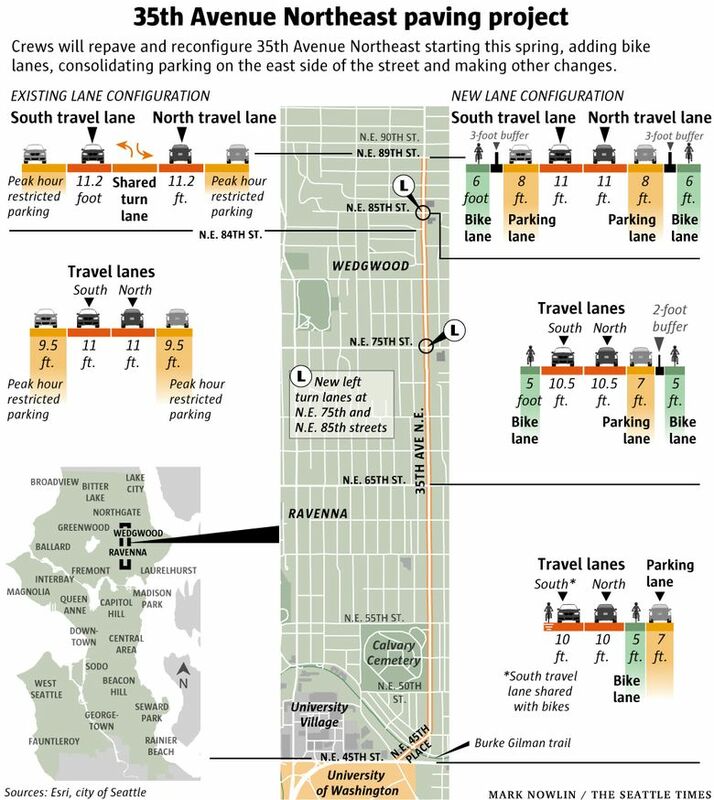 Supporters say the changes are a worthy price to pay to make the street work better for all users, not just drivers, and are needed to keep up with Seattle’s growth. Other changes planned for the roadway include updated curb ramps to meet the Americans with Disabilities Act standards, and sidewalk repairs. Left-turn pockets will be added to northbound and southbound lanes at the Northeast 75th and Northeast 85th street intersections, and bus lines, particularly Metro Route 65, will consolidate stops. Division over the project has even driven a wedge between longtime customers and business owners. Maygan Wurzer, owner of All That Dance at Northeast 85th Street, said one dancer’s parent sent a “scathing” email informing her of the family’s decision to withdraw from the studio over Wurzer’s opposition to the project. Wurzer worries the new bicycle lanes could pose a danger to pedestrians at what she views as already vulnerable crosswalks, as well as people getting out of their cars. The bike lanes and parking are the main sources of contention. “Our whole culture is changing because of a backward approach of forcing people out of their cars by having bike lanes,” said Rebecca Johnson, who helped organize the “Save 35th Ave” group that opposes the changes. Opponents point to 39th Avenue Northeast, a less-traveled street four blocks east with already designated bicycle markings, as a better place for cyclists to ride. Rachel McCaffrey, SDOT’s community outreach lead for the project, said the new bike lanes won’t come at the expense of drivers. The plan narrows the width of car lanes in some sections, but maintains one car lane in each direction. 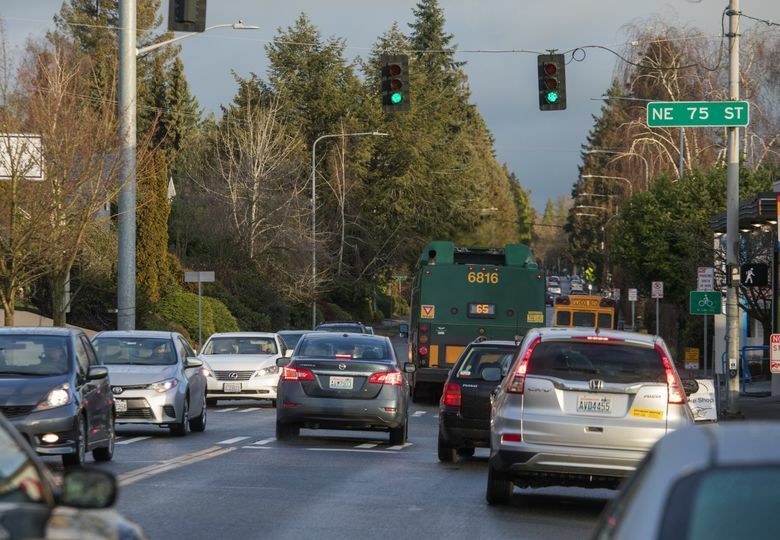 About 12,500 cars travel the section of the street north of Northeast 65th Street each day, and about 8,500 drivers daily use the street south of 55th Street, according to SDOT estimates. Critics also argue that few cyclists use the road now, but Kelsey Mesher, the Puget Sound policy director for Cascade Bicycle Club, said that would change with dedicated bike lanes. Parking will be consolidated to the east side of the street to make room for the bike lanes. To compensate, peak-hour parking restrictions now in place will be removed. But business owners are worried about any potential loss of parking space. “It’s important for businesses to have an easy flow of traffic so that patients and customers can easily access our place,” said Larry Adatto, who owns a dental practice along 35th near Northeast 75th Street. Both supporters and opponents agree safety improvements are needed. “The question in most people’s minds is: What does that safety improvement look like?” said Councilmember Rob Johnson, who previously worked at the transit advocacy group Transportation Choices. There were 24 crashes between June 2016 and June 2017 along 35th Avenue Northeast that caused an injury or property damage, according to data on the city of Seattle’s website. Three of those involved pedestrians. SDOT began outreach during the summer of 2016 to collect data and understand how the street is used. Efforts continued through 2017 and included knocking on doors, sending direct mailers and holding open-house meetings. Still, not everyone in the community understood the scope of the redesign. Tension came to a head at a community meeting in October. By that point, most of the design had been completed, and the meeting was held for information sharing. Zoë True, a Bryant resident who supports the changes, said she received a flyer on her door, but no invitation to a community event ever crossed her path. “I’ve heard similar feedback from people that they didn’t feel they were reached, and I think that’s an ongoing challenge that we have,” SDOT’s McCaffrey said. Public response to this project has led the agency to re-evaluate its outreach tactics. The project will be monitored throughout construction and once it is complete to make sure it’s working as intended. “If we got it wrong, and it is truly the hellscape that opponents think it may be from a traffic perspective, we can always go back and fix it at not a huge cost,” Councilmember Johnson said.